A self-fertile mid-season green gage, developed recently in the UK. Stella's Star has a mild gage-like flavour, and sets fruit far more readily than most gages. Stella's Star® is a protected variety. 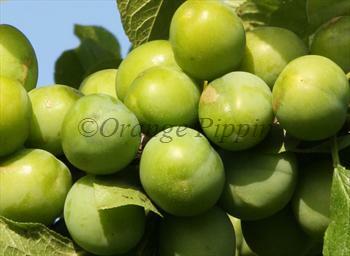 Please fill in the details below and we will let you know when Stella's Star plum trees are back in stock. Stella's Star is in flowering group 3. Stella's Star is self-fertile and does not need a pollination partner, although fruiting may be improved if there is a compatible tree of a different variety nearby. Since it flowers in the middle of the blossom season it can be pollinated by most other plum trees. Stella's Star is a self-fertile green gage, well-suited to the climate of southern and central UK. This is a naturally precocious variety, fruiting from a younger age than is usual with most gages. Fruiting can be prolific which can in turn lead to small fruit size, so it is worth trying to thin the fruitlets in May as this will increase the size and improve flavour of the remaining fruits. Developed in the 1990s by Hector Harrison, an amateur English plant breeder, and named after his daughter.